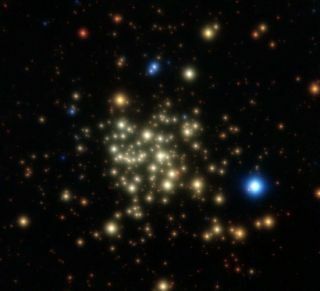 This image of the Arches Cluster of young, massive stars was obtained with NACO on ESO’s Very Large Telescope. The field of view is 28 arcseconds. A densecluster of young stars situated near the supermassive black hole at the heartof the Milky Way is surprisingly normal, with stars of high and low massesroughly in the same proportions as clusters in more tranquil parts of thegalactic neighborhood. Using the EuropeanSouthern Observatory?s Very Large Telescope (VLT), astronomers were able to getone of the sharpest views ever of this stellar assemblage, called the ArchesCluster. The result:Contrary to what astronomers had thought, the dense cluster follows what seemsto be a universal law regarding the distribution of stellar masses. The massiveArches Cluster is located 25,000 light-years away (a light-year is the distancethat light travels in a year, about 6 trillion miles or 10 trillion kilometers)toward the constellation of Sagittarius (the Archer). It contains about athousand young, massive stars, all less than 2.5 million years old, plus otherless massive stars. The name?Arches? does not come from the constellation the cluster is located in, butbecause it is located next to arched filaments detected in radio maps of thecenter of the Milky Way. The clusteris an ideal laboratory to study how massivestars are born in extreme conditions, as it is close to the center of ourMilky Way where it experiences huge opposing forces from the stars, gas and thesupermassiveblack hole that reside there. The ArchesCluster is 10 times heavier than typical young star clusters scatteredthroughout our Milky Way, and it is enriched with chemical elements heavierthan helium. With theadaptive optics instrument on the VLT, astronomers could remove the blurringeffects of Earth's atmosphere and were able to take images of the ArchesCluster that are even crisper than those obtained with telescopes in space. The clusterwas observed in infrared light because the gas and dust that lies between Earthand the cluster is impenetrable to visible light. The newstudy, to be detailed in an upcoming issue of the journal Astronomy andAstrophysics, confirms the Arches Cluster to be the densest cluster ofmassive young stars known. It is about 3 light-years across with more than 1,000stars packed into each cubic light-year ? an extreme density a million timesgreater than in the sun?s neighborhood. In fact the closest star to our sun isabout 4 light-years away. The sun isalso though to have formed in densestarbirth region, however, when other massive stars exploded and putpressure on the surrounding clouds of gas and dust. The sun then gotgravitationally booted out of its birth cluster and ended up a relative loner. Astronomersstudying clusters of stars have found that higher mass stars are rarer thantheir less massive brethren, and their relative numbers are the sameeverywhere, following a universal law. For many years, the Arches Clusterseemed to be a striking exception. "Withthe extreme conditions in the Arches Cluster, one might indeed imagine thatstars won?t form in the same way as in our quiet solar neighborhood," saidstudy team member Pablo Espinoza, who worked on the research as an undergraduatestudent at the Pontificia Universidad Cat?lica de Chile. "However, our newobservations showed that the masses of stars in this cluster actually do followthe same universal law." With theVLT image, astronomers could also observed the brightest stars in the cluster. "Themost massive star we found has a mass of about 120 times that of the sun,"said team member Fernando Selman of the European Southern Observatory. "Weconclude from this that if stars more massive than 130 solar masses exist, theymust live for less than 2.5 million years and end their lives without explodingas supernovae, as massive stars usually do." The totalmass of the cluster seems to be about 30,000 times that of the sun, much morethan was previously thought.